I'm a lightweight, so I rarely drink; beer, even less; alone, hardly ever. Tonight, I had a Negra Modelo here at home....alone.....holding an ice pack to my head, nursing what may be a concussion. And I still have to figure out my Absentee Ballot tonight, even balance my checkbook. Oh, the pain. How do I get myself into these predicaments? Well, let me count the ways.......I live in a cute building with 12 apartments and an absentee landlord. I'm sort-of, kind-of, the "Building Manager" which means only that I haul out all the trash and recycling every Thursday night and deal with the steam heating system, which means I have the luxury of crouching into a dark, dank room under the building once a week in the cold and rain, to "bleed" the pipes. I do not get a lower rent. I do not get special treatment. I get a little $100 check every month from the owners. There is no union for pseudo-Apartment-Building-Managers so my work conditions are pretty awful and the "pay" is paltry. Ahh, but I digress. A few weeks ago, some tenants "moved out," which is to say, they skipped out on two month's rent and left a disaster in their apartment. The landlord must have had someone clean out the apartment and put all of the trash into about 10 huge trash bags ~~ most of the trash bags contained mounds of potting soil that the tenants had left all over their balcony, dotted with cigarette butts and who-knows-what-else. Who does that? It's a nice building here, I swear. Anyway, whoever hauled out the trash made it as far as the little room where the heating controls are......which is only a few yards from the 2nd garage where the actual garbage cans are. Maybe the person who hauled all the trash bags down had a heart attack and died and thus failed to reach the second garage because now, weeks later, the smell in that storage room almost made me call in the C.S.I. Team ~~~ I know what dead-animal smells like (don't ask), and, yup, that's the sensory overload scent invading that room. This wouldn't matter except I have to go into that room anytime there is a problem with the heat (um, did I mention there is no lightbulb in that part of the storage room, where the controls are? ~ oh yes, this is getting good, isn't it? ); and I have to go through that room once per week to bleed the water pipes. So, last week I emailed the landlord and asked him to have his handyman come move all the bags before Friday morning's trash pickup. What does he do? He emails the adorable tenant on the 3rd floor to help me. What part of "this still involves ME touching those bags" does my landlord not understand? Anyway, somehow the cute boy upstairs and I never connect because we're never home at the same time, and he has no idea what the landlord is talking about. This afternoon, driving home from work, I was about to head to the grocery store ~~ happy that I just got paid and can eat more than crackers and cheese. But I remember that the trash gets picked up around 6 am tomorrow, and the bags have to be moved in daylight hours because there is no light down there. And, so I drive home to deal with the trash first, thinking I will go to the grocery store afterwards, and reward myself with two, not one, bag of groceries! Woo-hoo. Anyway, I go down to the storage room, holding my breath as I figure out how to start moving all the bags. It's cold and damp and disgusting and the bags feel like they are filled with dirt....oh wait, THEY ARE! I drag one bag a few feet out a back door, thinking I can drag it down the alley on the side of the building. I bend down, holding my breath, and because the bag is so heavy, I make a huge effort to stand up fast and yank the bag up........which I do, except I did not notice the ceiling/door beam down there was so low......and BAM my head crashed straight into the CEMENT CEILING BEAM. I shouted obscenities in about 3 languages...and realized I was breathing.....OH GAWD THE SMELL! Kill me now. With head throbbing, and potential dead animals in bag now falling out through the rips in the bag, I start dragging the damn thing into the alley. Only to discover that some other neighbors working on their yard and fence, had placed a huge trash can in the middle of the alley and filled THAT with dirt and bricks. ~~~ What's with the dirt all around here?! The huge can full of dirt is way too heavy for me to move. But my bag of dirt is already way out in the alley ~~ I can't now drag it back through the room of death and through the big garage and around to the front to the trash cans. So, I huff and puff and lift that damn bag full of dirt, up and around the CAN full of dirt! How does this happen to me? That took nearly 15 minutes. I still had about 8-9 more bags to go! And it's getting dark fast! My head ....is....throbbing.......I can't hold my breath much longer.......weird things have dripped out of the bag onto my tenny shoes. Kill me now......... I continue. I go back in the big garage and hunt around for something to help me move the bags of death-dirt. I spy someone's OFFICE CHAIR ON WHEELS! Oh, I am going to Hell-in-a-Handbasket because I grab that chair and decide I will use it to ROLL the bags of dirt out to the front. I feel bad and find a whole bunch of bubble wrap, and I try to wrap the chair in it so the death-dirt doesn't contaminate it. I take a big breath and run back into the storage room full of death-dirt. It's like a scene from Fear Factor now. Or Survivor, and I'm gonna vote my freakin' Landlord off the damn island. The bags are all tangled and it takes a few minutes, as I hold my breath, to pull one out and load it onto the chair on wheels....wrapped in bubble wrap. Did I mention I am also wearing a pair of yellow kitchen gloves that I found in a pot of dirt near the front of the garage? Oh yes, I look hot. Again, what's with all the dirt in this building!? I roll the chair out of the storage room, through the big garage, down the driveway, up the end of the block, and to the trash cans at the dead end. Green chair. Wrapped in bubble wrap. 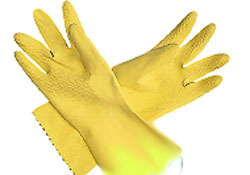 Yellow kitchen gloves. Dark blue Cal sweat pants with yellow double stripe down the side (to match my gloves). Cool red t-shirt that says, "Bésame que soy Mexicana!". Light blue sweater. Oh yeah. Hot. The bags filled 1-1/2 of those big, brown, apartment -building trash cans. Oh the smell. Of the dead weight of death-dirt. I walk back to the garage, and there is a trail of death-dirt from the back storage room to the street and to the trash cans. Evidence! I hurry up and put the chair back where it was. I was wearing yellow kitchen gloves so my prints won't be on anything. I think the bubble wrap kept most of the crap, except the awful memory, from tainting the chair. I need bleach or something to pour onto the floor in the little storage room so I can hose it all down. I go upstairs and let myself into my neighbor's apartment. Oh, didn't I mention I have a key to 3 of my neighbors' apartments? Well, they always say I can help myself to anything I need; so I do....often. I pet her cats (I left the gloves outside) but they seem pretty disgusted with me and walk away. No bleach in her place. I go up two flights to another apartment and look around in there. No bleach there either. But I did find a can of Trader Joe's chicken chili and, since I figure I can't drive to the grocery store with a concussion, I take the chili home to eat. Woe is me. Can you believe my glamorous life? I find half-a-bottle of Pine Sol in my apartment and pour it all on the floor in the storage room downstairs. The hose doesn't really reach from the front of the garage to the back storage room, so I put the sprayer on "jet stream" and hose it all down from a few feet away, from outside the storage room. I am wearing the yellow gloves again. I look ridiculous. And my head is throbbing. And my lungs are now filled with death-dirt air. The big garage door is open and probably my neighbors can see me, wondering "What The?!" "Who The?!" "WHAT is going on over there?!" ~~ I stand tall and try to look as if I totally MEANT to look like I do, and MEAN to be doing what I am doing, throbbing head and all. Yeah, Yeah, I meant to do that ~ to smash my head into a cement ceiling beam. Oy. I venture back into the storage room to sweep the water out (WHY am I doing all this?). As I try to move an old metal shoe rack, it falls onto my head and face! Who is trying to tell me something here? The ghosts from the death-dirt are out to get me, I think. Clutching my head, I slowly back out of the room, making note of the copious code violations and tort liability issues down there, and stumble up to my apartment. I keep beer and vodka and gin and other treats at my place for friends and company. Hey, I might be a lightweight, but I'm the hostess-with-the-mostess. Anyway, as I grab ice for my head, I decide NOW is as good a time as ever to "enjoy" a Negra Modelo. It reminds me of my friend Ian who loves Negra Modelo and, when sipping one over dinner with me, would always smile at me and make the same lame joke ~~ "Ai, si, como no me gusta la negra modelo" and I would always laugh and then we would make a toast to beautiful black models everywhere. OK, so my friend G. emailed me and pointed out that, when one fears they may have suffered a concussion, the LAST thing you let them do is drink, because they might pass out, fall into a COMA and DIE. (Note to Self: see why I don't drink (alone)? It's scary stuff man! Just Say NO!). G. also said, "Lucy, you got some 'splaining to do!" and told me I should dye my curls red and pass myself off as the Mexican Lucille Ball.......Mari Pelota? Then my friend D. emailed me, wondering whether my hair de-curled in the fiasco and I wondered if I could add an Afro to the scene. But, I must point out, I wore my hair pulled back (à la Trinity in The Matrix) and nary a strand was out of place, despite the splashing chemicals, flying death-dirt, and rolling bubble-wrapped chairs! My lip gloss stayed put, too ~~ thank you Aveda! Aveda.....I call it IN-VADA ~ its staying powers are legendary!! i also sport the lipgloss (lipGLAZE) of invada manufacture. it makes all of my menial chores more glamorous. i have been known to wash dishes in 3.5-inch snakeskin slingbacks, and i often vacuum in pearls (à la june cleaver). i realized en route to picking up odessa (Gin's little girl) the other day, clad in my yoga pants, high tops and ski vest, that it has been a WHILE since i have been, what could be called, "Properly DRESSED" as in, taking extra care in the a.m., doing anything more than SHAKING my hair. in fact, i have seriously been considering once again cutting it all off, just to be RID of it. ohmigod!! have i become this person?!?! this woman, who, no longer "girly," only thinks of comfort and NOT STYLE? i have almost given up glossy magazines entirely, mostly b/c of how i am haunted by feelings of inadequacy after paging thru all those models, even only briefly. (and don't let's talk about how i feel if i happen to glance at one of THEM in THEIR briefs!! yikes!!) so i was almost to the point of despair. . . . then i saw THIS, and was filled with strong strong yearnings, a desire for skirts and stockings, a facial and 'just the RIGHT scarf,' and hope for my feminine side flooded back to me. y'know, studies show a direct correlation between femininity and self-esteem in women (i.e., more girly = feelin' good!) ~~ and last night when jason (my baby-daddy) wanted a quick photo so that he would know it was ME calling him on his cell phone, w/o the bother of reading the caller ID, i quickly added lipgloss before letting him photograph me. i'm not even sure how i go to it, but i love your blog! it's a great mix of personal, politial, serious and fun. you've inspired me to write more on mine. i'll do that once i recover from running an election protection hotline monday and tuesday. oh yeah, sorry about the concussion. anyway, hope you enjoy mine.